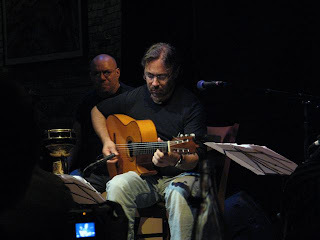 10/31/07, The Dakota: Al Di Meola has been off my music radar for years. The only CD of his I have is Elegant Gypsy, recorded in 1977; I must have picked it up during my fusion days, and I haven't listened to Di Meola since. He's currently touring with two projects: the Rite of Strings and the current version of his World Sinfonia, begun in 1990 and now in its 2007–08 incarnation. He brought the World Sinfonia to the Dakota for two nights; we caught the last set on the second night, and I wish I had gone more than once. I didn't know any of the songs they played, but I didn't care. This was music so beautiful and rewarding to hear that the sometimes yakky Dakota crowd was stone silent and rapt. Toward the end of the set, I looked around to see people standing along the edges of the room and leaning over the mezzanine. All eyes were on the stage, where DiMeola and the other members of his quartet—Fausto Beccalossi on accordion, Peo Alfonsi on guitar, Gumbi Ortiz on percussion—brought us music from Argentina, the Middle East, and the Mediterranean. DiMeola makes other guitarists look like they play in slo-mo; his hands are a blur, yet every note comes through. Ortiz mostly played the cajon, an Afro-Peruvian percussion instrument that looks like a big wood box; he also had a small drum on a stand in front of him, and he played that with his hands as well, but that was the extent of his array. 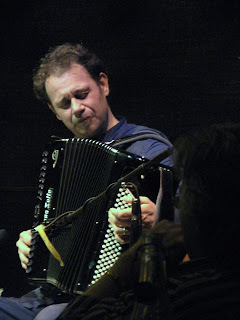 Beccalossi played an accordion that was all buttons on both sides, and he vocalized—a kind of wail that rode over the music and wove through it. I had never heard an accordion make such sounds, both high and low. Alfonsi mainly accompanied Di Meola but was given a solo late in the evening and more than held his own. I know Di Meola is a guitar god (acclaimed virtuoso, winner of countless awards, one of the Big Three with Metheny and McLaughlin, dozens of CDs) and I should have been paying attention, but you can't hear everything and keep up with everyone no matter how hard you try, and that's all I'll say about that. I'm just glad I was there on Halloween night, when he briefly ranted about Britney Spears and how we're pelted daily with the trivial details of her squandered life while he can't get arrested in the media. Mostly he just played and played. Called back for an encore, he gave us another short set with Ortiz by his side. Beccalossi and Alfonsi joined them for the final tune, an anthem from Sardinia about, as Di Meola told us, "people I miss." It made me think of people I miss, and how I wished they had been there with me. Photos: Al Di Meola and Gumbi Ortiz; Fausto Beccalossi. Fausto photo by John Whiting. Thanks for the nice review and photos. I just heard Al's quartet in Rochester, NY on Nov. 9th. What a beautiful evening! This is Al's most romantic and soulful ensemble I've heard in my 26 years listening to his music.